The worth of Indian art and culture is immeasurable. Apart from the thriving cultural heritage of India in the capital cities, the country’s artistic potential is nipped in villages like Raghurajpur. As focus of the tourism industry is mostly concentrated in adventure, food, beach and luxury sectors; rural areas are neglected in the public eye despite their rich handcraft culture. Most of the folk art forms and tribal cultures remain hidden in the wilderness due to their lack of exposure to the light of civilization. For example, the art and craft of Raghurajpur in eastern India. Indian Eagle, out of its social responsibility, highlights what makes Raghurajpur a must-visit art & culture destination. Raghurajpur is a handicraft village at a 14-km drive from Puri, the best pilgrimage destination where the most famous Rath Yatra festival is held in the state of Orissa. 50 km away from Bhubaneswar, Raghurajpur is a village of artists, painters and craftsmen who live in art, dream of art and drink to art. A micro presence on the macro cultural map of India, this Oriya village is worth the value of a tourist destination not just for its opulence of art but also for its idyllic setting amidst coconut, palm, jackfruit and mango groves on the southern bank of the Bhargavi River. Most of the houses are made of mud in the village, and the outer surface of the walls of the houses is decorated with beautiful mural paintings which visually depict mythological glimpses from two great Indian epics – the Ramayana and the Mahabharata. Raghurajpur, the cradle of artists, is one of the thousand places in rural India where handicraft has been a chief source of livelihood for generations. 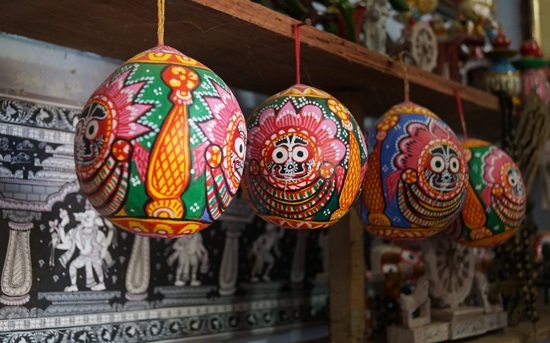 This village in Puri district takes pride in not a single artwork but an assemblage of artworks including stone engraving, wood carving, mask making, Tussar painting, palm leaf engraving, and pata chitra. Craft, carving, painting and dance form the cultural excellence and artistic treasure of Raghurajpur. Pata chitra painters create enchanting poetry on pieces of cloth, dried palm leaves and paper with the magic of creativity and colors. 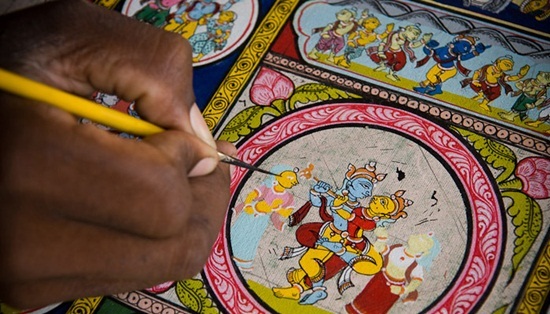 Pata chitra is an age-old folk art which today’s artists have traditionally inherited from their forefathers. In this art form, a variety of miniature painting, mythological stories and religious themes are depicted as delicately as possible. Natural dyes are used to beautify the painting done on the polished surface of a piece of cloth and a palm leaf. The most popular theme that most of the pata chitra painters work on is the Dashavatara, the ten incarnations of Lord Vishnu including Matsya, Kurma, Vaman, Varaha, Narasimha, Buddha, Rama, Krishna and Kalki. The stories of each of these incarnations are depicted meticulously using a complete palette of colors made from natural ingredients. Paintings of Ramlila, Raslila, Ayodhya Vijay and other scriptural themes on Tussar saris are influenced by pata chitra. Orissa tourism basks in the glory of Raghurajpur art and craft. Besides handicraft, Gotipua Dance is another highlight of this art-loving village. This traditional folk dance form is integral to Orissa’s tribal culture and is performed by boys in the guise of girls. The dance is performed as a worshipping ritual to please the Deity of the Puri Jagannath temple. The performers are called Gotipuas. Some of the Gotipuas like Kelucharan Mohapatra have made their way to international stages abroad. Kelucharan Mohapatra, a legendary Gotipaus, was born in the village. Indian National Trust for Art and Cultural Heritage brought Raghurajpur to the light of civilization and put it on the list of cultural tourist destinations by declaring it as a heritage handicraft village. It is one of the villages to be developed under the purview of rural tourism in India. Indian Eagle connects NRIs with Indian culture, art and craft by booking the cheapest flights for them to India throughout the year. Do check the available lowest airfare on IndianEagle.com.